I’m finishing up my series today on the James Island (South Carolina) Presbyterian Church cemeteries. Beside the Robert Rivers Bee Jr. family plot is the Stiles-Hinson plot. You may recall that Robert Jr. was married to Martha Stiles Hinson, daughter of Juliana Bee Rivers Hinson and Joseph Benjamin Hinson Jr. As I told you last week, there was quite a bit of “cross pollination” between the Bee and Rivers families. The Hinsons were also a part of that mix. 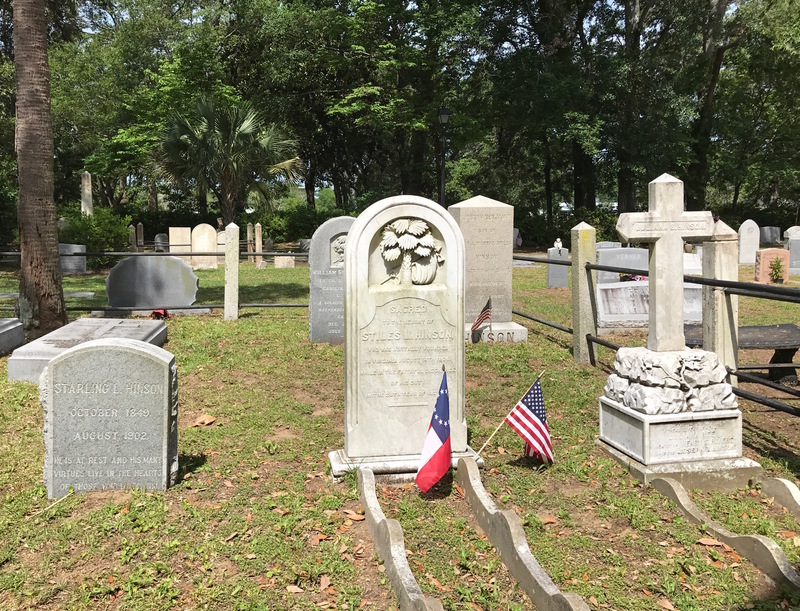 This is the Stiles-Hinson plot at James Island Presbyterian Church Cemetery. 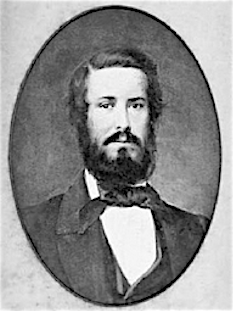 Joseph Hinson Jr.’s father was Captain Joseph Hinson Sr., born in 1772 in South Carolina. 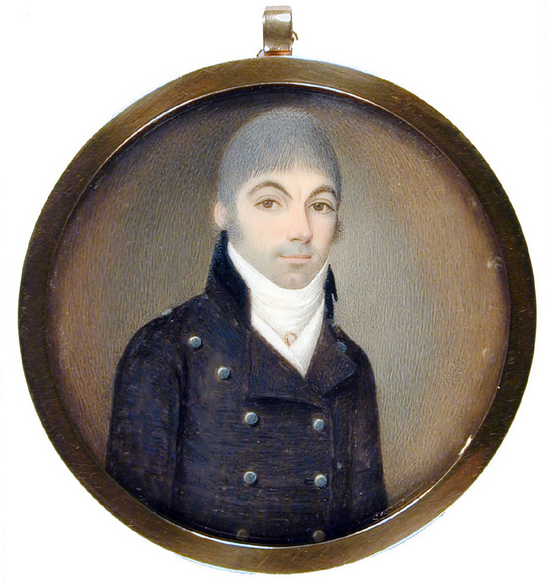 The Gibbes Museum of Art in Charleston has a miniature portrait of him. A ship’s captain, Hinson traveled the route between the Carolinas, England and Bermuda. He married Martha Stiles in April 1797. Together, they had three children that included Joseph Jr.
At 29, he was presumed lost at sea in 1801 so he has no grave site. That left Martha a relatively young widow at the age of 26. She remarried in 1805 to William Godber and they had a son, William Stiles Godber. This would be Joseph Jr.’s half brother. 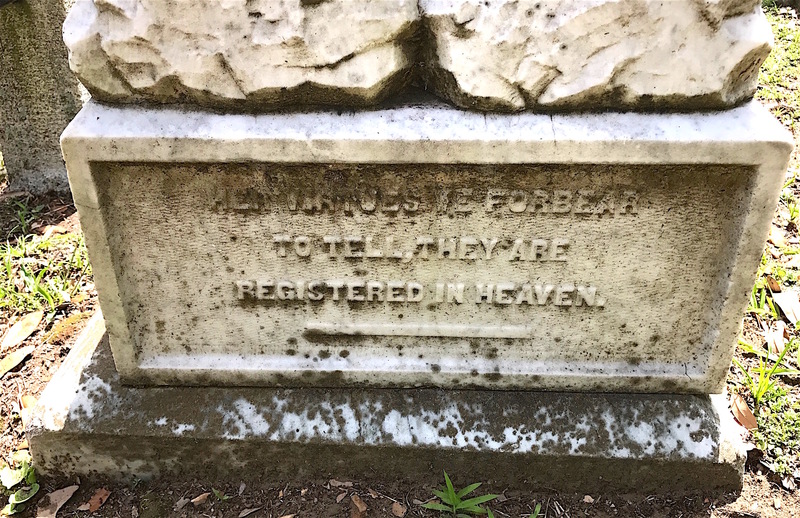 I don’t know when William Godber died (he is not buried with his family and he has no memorial on Find a Grave) but Martha died on Dec. 5, 1846 and William Stiles Godber died a few days later on Dec. 10, 1846. It’s possible another yellow fever plague was ravaging Charleston/James Island at the time. 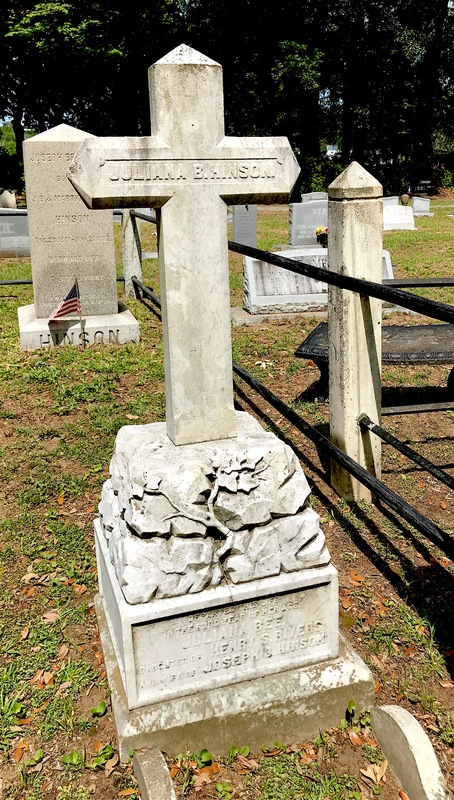 Both Martha and William (her son) are buried in the Stiles Family Cemetery at Stiles Point Plantation on James Island. Stiles Point Plantation was owned by Martha’s father, Benjamin Stiles. You’ll here more about this later. Joseph Hinson Jr., born in 1801, married Juliana Bee Rivers and they had eight children together. Joseph was a successful planter and did well. They are both buried at JIPC’s cemetery. Joseph’s monument is rather plain compared that that of his wife. 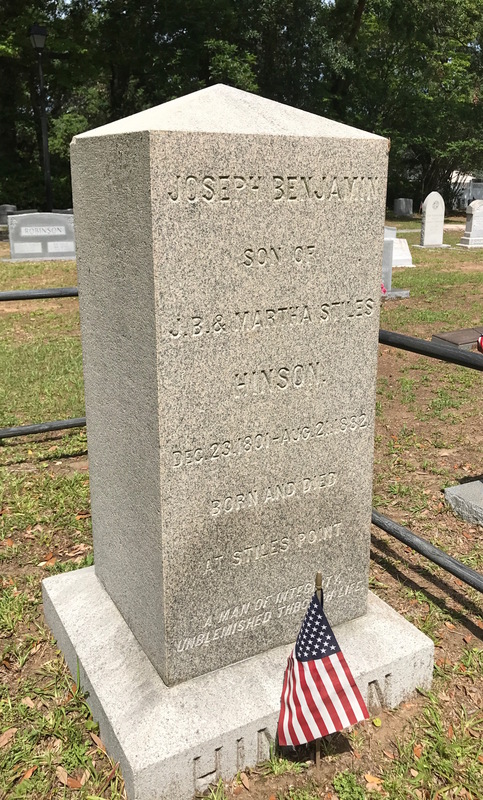 Joseph Hinson Jr.’s monument notes that he was “born and died at Stiles Point.” He was 80 when he died. Juliana would die in 1870 at the age of 63. Her cross monument is bolstered by a base that resembles a rock with a vine or branch growing up through it. Juliana Bee Rivers Hinson was the daughter of Henry Sterling Rivers. You can see her husband’s monument behind hers. There’s something interesting about Juliana’s cross that bears mentioning. I tell people not to only photograph the front of a monument. Look at every side if you can because there may be an epitaph or even the record of another person inscribed there. This was true for Juliana. Juliana Hinson’s epitaph is brief. In other words, her good qualities are so numerous that we can’t list them all here in this rather small space. Joseph and Juliana’s son William Godber Hinson is someone I did find a good deal of information about. 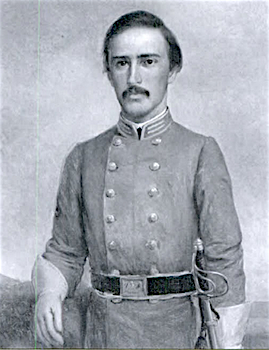 Born in 1838, William served in the Confederate Army in the Rutledge Mounted Rifleman and Horse Artillery as a 2nd Lieutenant and was wounded three times in the line of duty. Family history says he was almost killed when his horse was shot and fell on him. 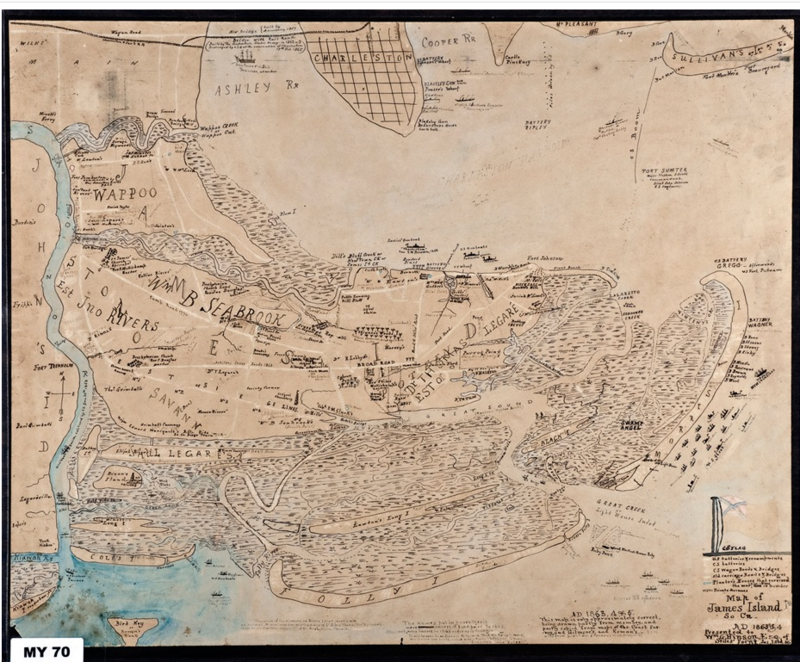 The Charleston Museum has in its collection a detailed 1887 map of James Island drawn by Robert Eliot Mellichamp, whose father was the Rev. Stiles Melilchamp. On the back of the map is a document called “Sketch of James Island” that was written by William Godber Hinson, which I’ve added a link to above in case you want to read it. The document contains not only the history of James Island (from Hinson’s point of view) but mentions items of agricultural, historical and archaeological interest. Names of property owners are included. It’s quite a historical gem, all things considered. After the war, William returned to James Island. He inherited Stiles Point Plantation from his uncle, William Godber, for whom he was named. He became a successful planter, a community leader, and a well-read scholar. His death certificate indicates he never married. One interesting point I’d like to share is what William did to the Stiles-Hinson House at Stiles Point Plantation. Originally built in 1742 by his paternal grandfather Benjamin Stiles, William added the 1891 portion of the house and continued to keep the plantation active until the early years of the 20th century. The back-to-back arrangement of a relatively unaltered 18th-century cottage and a late 19th century Victorian mansion is most unusual and unique in that area. Three different views of the Stiles-Hinson House at Stiles Point Plantation. The one on the bottom right shows where the two houses were attached. According to the 1973 National Register of Historic Places application, despite their “wedded interior”, the exterior of both houses are characteristic of their respective historic periods. The Stiles portion of the house is an example of a mid-18th century planter’s house, with a modified bell-cast gambrel roof, projecting shed dormers, and the double shouldered brick chimneys. The structure is one-and-a-half stories and rests on a low foundation. The Hinson house is a Victorian structure with a high ceiling, bracketed cornices, a mansard roof, and wooden balustrades. This addition is two-and-a-half stories and is supported by low brick piers above a partial basement. 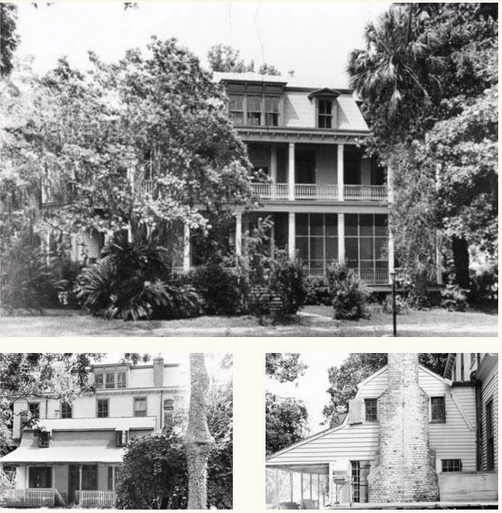 Today, the Stiles-Hinson House is situated among three, four and five-bedroom single-family properties that range from $480,000 to $1.5 million that were built on Stiles Point Plantation land. It’s definitely a well-heeled neighborhood. 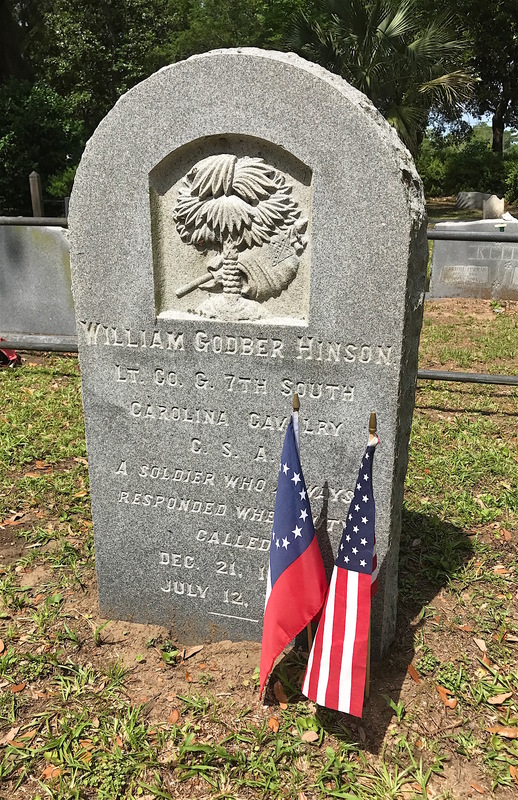 Although he has no descendants, William Godber Hinson made his mark on James Island history. William spent the rest of his days at Stiles-Hinson House, as did his father, Joseph B. Hinson, Jr., and a number of other family members over the years. His agricultural expertise made him a sought-after resource on James Island, helping to found the James Island Agricultural Society in 1872. He died in 1919. The Stiles-Hinson plot also includes another of Joseph and Juliana’s children. Born in 1836, Stiles Melichamp Hinson was recruited to serve with Company A of the Rutledge Mounted Riflemen and Horse Artillery. On July 1, 1862, he enlisted as a private into this command for the duration of the war. His unit would officially become known as Company B, 7th Regiment South Carolina Cavalry. His brother, William, served in the same unit. 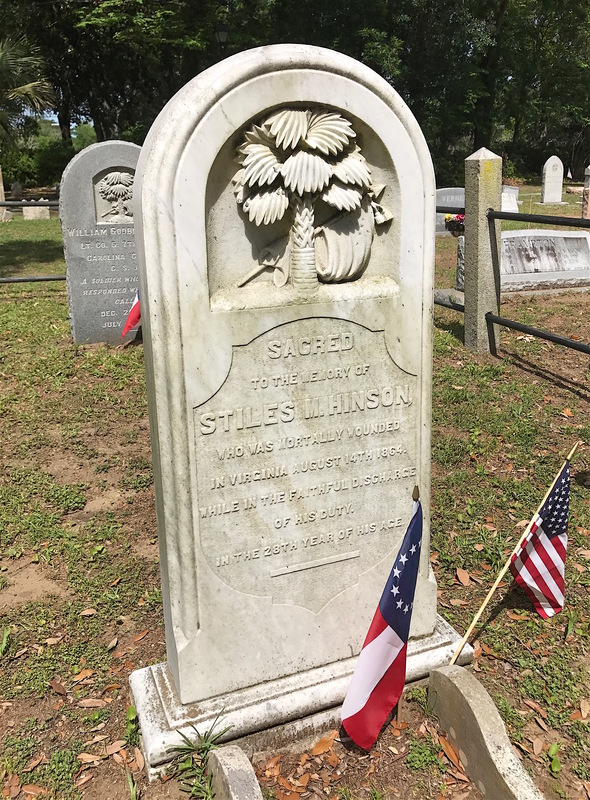 Stiles Hinson’s marker bears the same South Carolina palmetto and flags as that of his brother, William Godber Hinson. During a skirmish at Fussell’s Mill, Va. in August 1864, Stiles received “a gunshot wound thru the right arm … the ball passing in [his] body lodging” next to his spine. Receiving treatment at General Hospital Number 9 in Richmond, Va., it was a wound he would not survive. He died on August 15, 1864 and was buried at JIPC Cemetery. He was 28 years old. Finally, I’d like to include another Hinson sibling. Her monument is the largest in the Stiles-Hinson plot and was carved by W.T. White, whose work was well known in Charleston. It is a tall column with the stop broken off, indicating a life cut short. Born in 1833, Sarah Rivers Hinson married bookkeeper Paul States Lee Lockwood on March 20, 1856 at the age of 23. She gave birth to their daughter, Sarah Pauline Rivers Lockwood, on August 22, 1857. Sarah Rivers Hinson Lockwood was only 24 when she died. Sarah died only six months later on Feb. 28, 1858. According to Paul’s will, it appears that he sent Sarah Pauline to live with her grandparents, Joseph and Martha Stiles Hinson, then moved to Mobile, Ala. to be near a brother. In 1861, he enlisted in the Confederate Army. Paul Lockwood would die in July 1862, serving in the Third Alabama Infantry. Sarah Pauline lived well into adulthood, married John Mikell and died in 1933. She is buried at the Presbyterian Church on Edisto Island Cemetery. Paul Lockwood’s burial site is unknown. 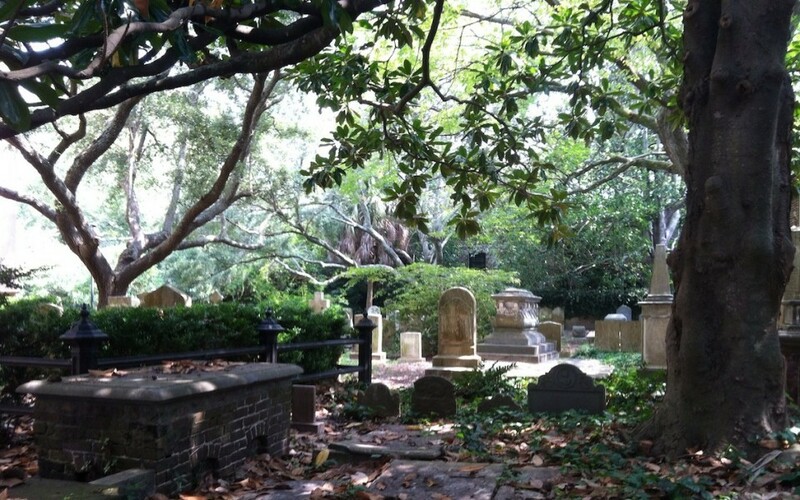 I’ve got one more cemetery to show you before leaving James Island. I hope you’ll come back for that journey.